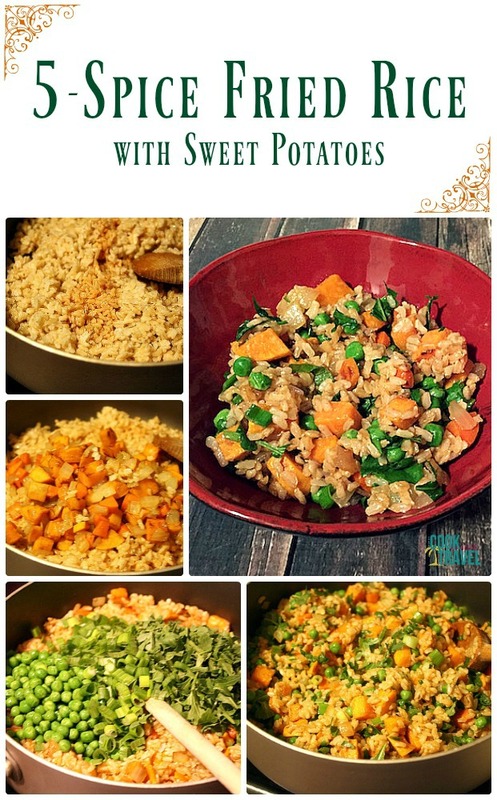 You are here: Home / Blog / Healthy / 5-Spice Fried Rice with Sweet Potatoes is Lovely! 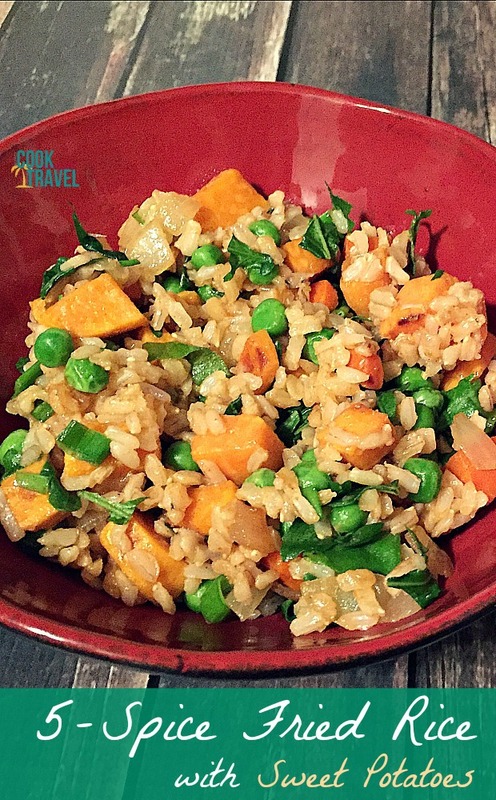 5-Spice Fried Rice with Sweet Potatoes is Lovely! Can I first just say that I’m LOVING this KC weather. Fall is definitely just around the corner, and it’s been really lovely here in the past few days. So hopefully you’ve been having some fabulous temps where you are too and are soaking up the sun as much as you can. And I was in the mood for something healthy but also a bit comforting. 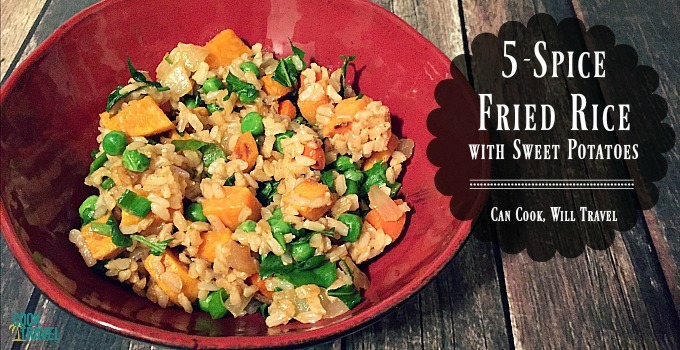 Enter: 5-Spice Fried Rice with Sweet Potatoes! Last week I featured the Thug Kitchen cookbook, and I’ve been anxious to cook something from it since the moment I started flipping through it. And the one dish that kept popping up in my mind was the 5-Spice Fried Rice with Sweet Potatoes recipe. Making something that was both healthy and wasn’t a salad seemed like a must for me this week. The healthy part was a guarantee with this cookbook, but I really wanted a dish that I would be excited about. And I’m a huge fan of anything involving rice, so it was a natural choice. It’s not out of the ordinary for me to just make a meal out of rice and soy sauce. Admittedly I haven’t cooked much with brown rice, but that was all about to change this week. The Thug Kitchen peeps are right that brown rice is SO much more flavorful. It is filling, has great texture, and a nutty taste. The only downside is that it takes longer to cook. So my recommendation for this 5-Spice Fried Rice with Sweet Potatoes recipe is to cook the brown rice in advance. I made mine the day before. That way I could just pull it out of the fridge and cook with it when I was ready. So easy. That just meant that the majority of the work I had to do was to prep the veggies. To do that, I diced up a carrot, sweet potatoes, half an onion, and chopped some green onions and arugula. Then you just cook the potatoes, along with some onions, minced garlic and 5 spice powder in a little oil and water. Remove the veggies from the pan, and go ahead and add the rice and get it heated through. You’ll whip up a quick sauce of soy sauce, rice vinegar, and Sriracha. Add that to the rice, then add back in the cooked veggies and let it all heat through. Finally add the green onions, some thawed peas, and the arugula. That’s it. Literally it couldn’t be easier! Let’s talk flavors here. The 5 -pice powder hands down brings the biggest flavor if you ask me. You’ll find this powder is popular in Chinese cuisine. While it can include a few different spice combos, mine included fennel seed, star anise, ginger, cloves, and cinnamon. Quite the flavor combo, right? You have savory fennel, bright ginger, and the really warm flavors from star anise, cloves and cinnamon. All of the savory, spicy flavors really help permeate the entire dish and you’ll taste them in every bite. And while you’re thinking that there is Sriracha in this dish that it must be spicy . . . it is not. There’s only a teaspoon of Sriracha so it just gives a mild, subtle heat in the background. Nothing overpowering at all. This dish comes together really fast once the ingredients were prepped. Gotta love that! And I prefer to prep everything in advance, so I can start throwing stuff in the pan. And this dish is jam packed with veggies, which I love. So you can feel really, really great about enjoying a bowlful of the 5 Spice Fried Rice with Sweet Potatoes or it makes an awesome side too. You’re sure to adore the great textures and flavors that this 5-Spice Fried Rice with Sweet Potatoes dish offers. So click that link for the recipe and step by step instructions! Happy veggie eating!! Three years ago: Hola Chicken Tamale Casserole!